The retail cohort reported a mixed bag during the most recent earnings season with Target (TGT), Khol’s (KSS), Gap (GPS), WalMart (WMT), Best Buy (BBY) and the Retail ETF (XRT) all experiencing downward pressure. This pressure has been exacerbated by the market wide sell-off in the broader indices. Hasbro (HAS) has struggled to find its footing moving into its historically biggest quarter. Hasbro is setting the post Toys R Us bankruptcy narrative and laying out a business roadmap for long-term profitable growth across its brands. The headwinds attributable to the bankruptcy of Toy R Us appear to be subsiding. This sentiment has been further bolstered by positive commentary from its CEO that the company will absolve itself of this Toy R Us related bankruptcy headwind come 2019. As Hasbro realigns and effectively manages the Toy R Us liquidation, this challenging backdrop is beginning to resolve itself to Hasbro's benefit. There are many current and future growth catalysts for Hasbro in movie franchises such as Marvel, Star Wars and other Disney (DIS) properties (Hasbro is the exclusive toy maker). Potential e-sports with Dungeons and Dragons and Magic: The Gathering, newly acquired Power Rangers franchise which will emulate Hasbro’s My Little Pony and Transformers’ Bumblebee within Hasbro Studios and its legacy games such as Monopoly and Nerf. Hasbro may benefit from a strong consumer, record low unemployment, a strong and growing dividend yield, clear skies post Toy R Us liquidation and putting forth initiatives within Hasbro Studios to further propel growth thus presenting a compelling long-term buy. Analysts are predicting e-commerce toy orders to balloon to 40% of overall sales this year, up from 28% last year. Since Toys R Us has gone bankrupt, this puts a void of ~14% of last year’s U.S. toy sales that needs to be bridged, translating into $2.5 billion in revenue. This void will likely be filled by Target, Walmart and Amazon (AMZN) which recently, for the first time it will offer free shipping to everyone through the day before Christmas with no minimum purchase required. Per Jefferies analyst Stephanie Wissink, 70% of toy sales occur during the holiday season. Target and Walmart have announced expanded free-shipping programs of their own to drive online sales. Wissink sees Hasbro’s stock hitting $120 within a year and notes that the overall set-up for 2019 looks better than 2018. As other retail chains close the gap with the Toys R Us vacancy, Hasbro will likely return to form and growth across its brands. Hasbro has one more quarter to report earnings in which the Toys R Us issues will be impacting its numbers. 2019 will be free of this headwind, and all numbers will come full circle and be compared to post Toys R Us landscape. Previously, Jim Cramer interviewed Hasbro’s CEO Brian Goldner on Mad Money, and he was confident that “the worst is over” for Hasbro as the Toys R Us liquidation unfolds. Goldner went on to say "I am certain that, a year from now, we will not be talking about Toys R Us in this negative light," Goldner added. On July 23rd, Jim Cramer caught up Goldner to assess the progress Hasbro was making towards circumventing the Toys R Us liquidation and its other growth initiatives within the company. Goldner stated, “We’re lining-up share recapture plans with our remaining retailers, building bigger programs for the holidays” while “working through the European situation, there’s be disintermediation between online retail and the brick and mortar retailers, we’ll work through all that as well and believe that all these issues will disappear by the end of 2018 and we move on to grow in 2019”. On October 23rd, Jim Cramer conducted another interview with Brian Goldner, and he discussed progress on Hasbro’s initiatives and provided some color on a monopoly game centered around Fortnite, highlighting that this was Hasbro’s top-selling product in the first week of Q4. He also discussed the growth potential of esports franchises Fortnite and Overwatch as major catalysts into a new pillar of offerings. These franchises are already playing out via toys "we have Nerf Overwatch coming, where you get to play the game for real," and "That will follow with Nerf Fortnite." Hasbro has also been beta testing new online games based on its legacy Magic: The Gathering, Dungeons & Dragons and Wizards of the Coast franchises. Teasing "an announcement from us shortly talking about how we're going to enter into esports in a major way," Goldner stated. Q3 Earnings – Last Revenue Decline? Toys R Us filed for chapter 11 bankruptcy in September of 2017, and since then Hasbro has had challenges meeting its revenue and EPS targets. Post Toys R Us disruption, Q4 2017 revenue numbers came in flat while Q1 2018, Q2 2018 and Q3 2018 revenue numbers fell by 15.7%, 7% and 12%, respectively. Hasbro is already trending back towards growth, Q4 2018 will be compared to weakened numbers due to the fall out of the bankruptcy of one of its major retail channels. Moving further into the first half of 2019, this comparison will be even more pronounced and put Hasbro back on a growth path. Q3 2018 revenues came in at $1.57 billion with U.S. and Canada revenues down 7% and international segment revenues down 24% for a net decrease of 12%. Net earnings came in at $263.9 million, or $2.06 per diluted share while the company returned $159.5 million to shareholders in the quarter, including $80.0 million in dividends and $79.5 million in share repurchases. Per Hasbro’s quarterly report, the lower revenues reflect lost Toys R Us revenues in the U.S. while the company is addressing the changing consumer shopping behaviors, a rapidly evolving retail landscape and clearing through retail inventory in Europe and the Asia Pacific. Moving forward Hasbro (HAS) is positioned for long-term profitable growth (Figure 1). Hasbro shelled out $80 million in cash dividends to shareholders during the Q3 2018. 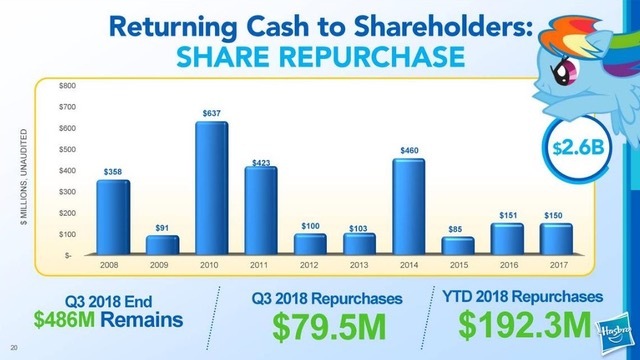 Regarding Hasbro’s share repurchase program, during Q3 the company repurchased 801,466 shares of stock at a total cost of $79.5 million and an average price of $99.14 per share. Through the first nine months of 2018, Hasbro repurchased 2 million shares of common stock at a total cost of $192.3 million and an average price of $93.88. At the end of Q3, $485.7 million remained in the current share repurchase authorization program. Hasbro has consistently raised its dividend and been shareholder friendly over the years (Figures 2 and 3). 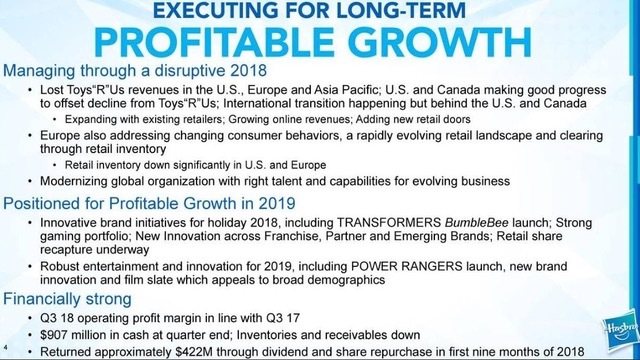 Hasbro (HAS) is turning the corner with regard to the Toy R Us liquidation and “believe that all these issues will disappear by the end of 2018 and we move on to grow in 2019”. To this end, Hasbro has exclusives with Wal-Mart (WMT), Target (TGT) and Amazon (AMZN) while building out it direct to consumer channel to mitigate the fallout of Toys R Us. Hasbro has many growth catalysts on the horizon via the diversity of its portfolio. Hasbro presents a compelling long-term opportunity with a great shareholder return policy via dividends and share buybacks. Despite the Toy R Us bankruptcy filing, Hasbro looks to be managing this liquidation and further penetrating into digital and footprint channels of distribution. Analysts are coming in with positive commentary regarding the long-term outlook on Hasbro as the turn away from the retail overhang gains more traction into future quarters. Moving forward all future quarterly numbers will be compared to depressed revenue figures post Toys R Us fallout presenting a return to growth as this overhang is effectively managed and comes full circle. Disclosure: The author does not hold shares of Hasbro. The author has no business relationship with any companies mentioned in this article. He is not a professional financial advisor or tax professional. This article reflects his own opinions. This article is not intended to be a recommendation to buy or sell any stock or ETF mentioned. Kiedrowski is an individual investor who analyzes investment strategies and disseminates analyses. Kiedrowski encourages all investors to conduct their own research and due diligence prior to investing. Please feel free to comment and provide feedback, the author values all responses. The author is the founder of stockoptionsdad.com a venue created to share investing ideas and strategies with an emphasis on options trading. Do you still hold the same sentiment in spite of them being sued for allegedly misleading their investors? Their stock seems to be tanking in light of this recent news. Do you expect them to recover soon? I didn't look into the lawsuit issue as lots of companies get sued for various reasons. The long term thesis remains intact with drivers beyond toys (i.e. e-sports and Hasbro Studios). 2019 should absolve Hasbro of any lingering Toys R Us related issues and this holiday season is shaping up to be huge across the physical footprint and digital channels. 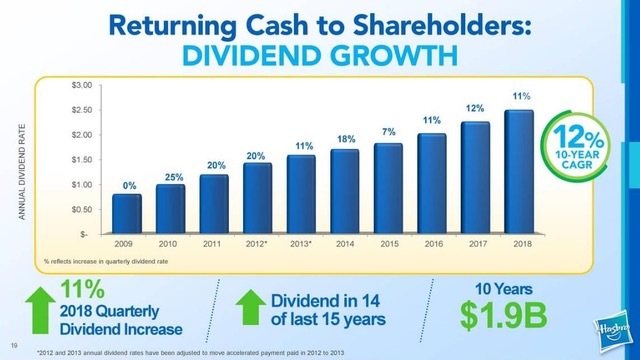 The dividend is strong and the buyback demonstrates management's conviction in the long term narrative.